"I want to build a big house with many, many rooms and fill it with all the street kids." I said this 9 years ago while we were driving through the impoverished streets of Jakarta, Indonesia. I was then a first grader at the Jakarta International School. Back then I couldn’t understand why there were kids playing under the flyovers while I had to go to school. On trips to Manila I also noticed that kids were on the streets selling newspapers, cigarettes, and candies. Again, I would ask, why are they on the streets? At 6, I could not fully comprehend words like homeless, unemployed, and underprivileged. I could not empathize with the kids on the streets, but I knew that they must want to have a house to sleep in when night comes, when they can no longer play. But soon after, our family moved to Singapore and I no longer witnessed the realities of the third world countries in Asia. Within the protective bubble of Singapore my concerns over the unfortunate seemed to have faded away. My awareness of poverty re-emerged in the 8th grade when we were assigned a community service project to help the less fortunate. There were many possibilities available for me to choose from such as house building trips going to Cambodia and Thailand, but I didn’t feel attached to these options. Little did I know, my mom discovered a Philippine-based organization called GK. Since I’m half Filipino and I always visit the Philippines, I decided to join the service trip to Manila to build houses for a poor community. Before the trip, I hosted a neighborhood barbecue at my home. The funds were intended to buy school supplies for the kids at GK-Aya Village (a GK village sponsored by Mr. Tony del Rosario’s family). Thanks to the generous hearts of the guests, we raised almost $4000 that night – enough to build a home in the village! And that is what the money was going to be used for. In late January of 2010, prior to my school trip to Manila, my dad and I took a weekend trip to Manila to meet Tito Tony Meloto. He took us to Enchanted Farm in Bulacan where I was introduced to the idea of self-sustainability. A few weeks later, I left Singapore with my SAS classmates to what was going to be my first house-building experience. I was determined to change lives, but during the trip I realized that the people there changed my life instead. They helped me to see what really matters in my life, and it is to give back what I have so fortunately received. That is true happiness – at least for me. When I arrived in Singapore I felt accomplished, but after having a taste of the joy from the smiles of the poor I wanted more. So the next year I went on another GK trip and once again was inspired by the strength I saw in the people who faced a life of difficulties. But all the things I have been doing have not gone unnoticed. 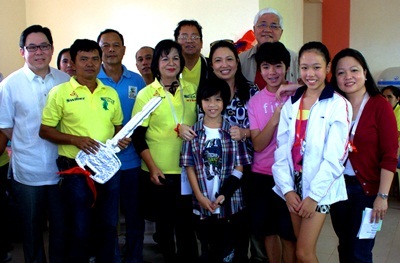 My father took an interest in GK because of my enthusiasm in supporting this organization. My dad took my vision and brought it to his company, Swiber. After a short six months, they had already begun building the first 22 of the 64 houses planned. My parents were not the only ones supporting my cause. My sister Renee and her friend Alexis Langlois were inspired by my efforts. Renee and Alexis were in 6th grade last year and they developed a plan to make tap water accessible to the residents in Swiber Village. If a family can raise 30% of the cost to install a water meter, they will donate 70% to the total cost. They set out to raise funds for at least 5 families, but surprisingly, they made it possible for all 22 families to get a meter installed. 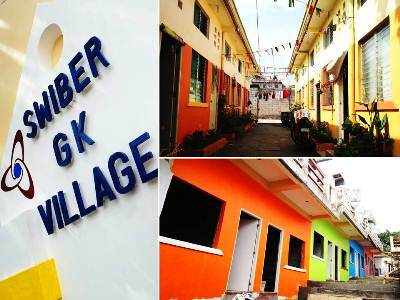 This summer my family and another Singaporean family built and painted houses for the remaining houses in Swiber Village. That was my brother Joshua's first house build. He is 9 years old. I am now in 10th grade and I am an Officer in the Singapore American School GK club. I am thankful that I am in this position because I can contribute, and involve more people in my GK journey. An SAS Village with many, many houses – that's the dream! Gawad Kalinga is not a charity, rather, it's an organization that aims to end poverty by building sustainable communities. This would not be possible without partners like Swiber who have journeyed with us in changing the lives of others. You too can help GK build communities in poverty-stricken areas. Partner with us in building a safer, kinder world for the next generation.